after one taste of French food ... I was hooked. I'd never eaten like that before, I didn't know such food existed. The wonderful attention paid to each detail of the meal was incredible to me. I'd never really drunk good wine before, and knew nothing at all about it. It was simply a whole new life experience. Julia Child. 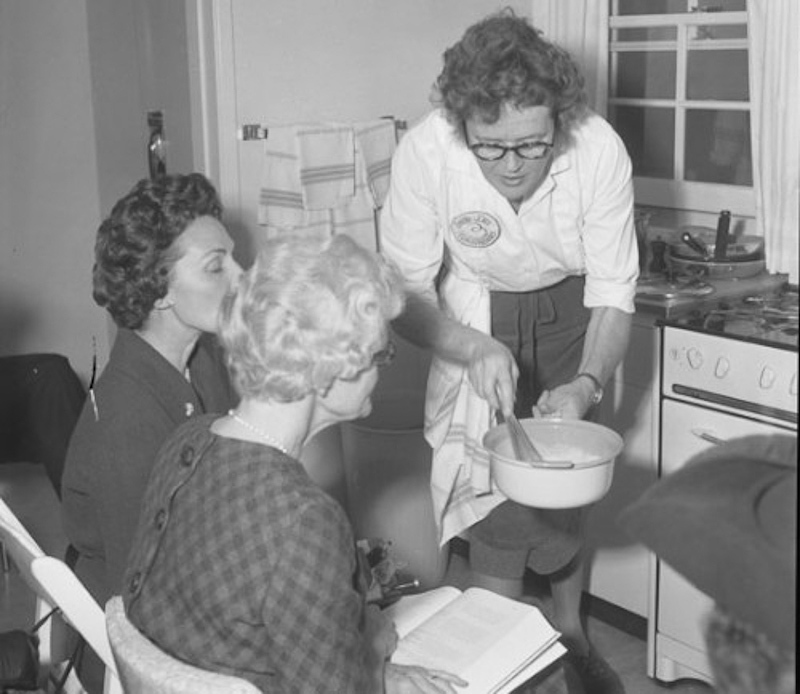 On August 15th, Julia Child would have been 100 years old. It's no secret that she's one of my heroines. Every time I hear a quote or see a photo. I'm amazed at the path she blazed for women, especially in food. She was 49 when Mastering the Art of French Cooking was published, and 51 when she first appeared on television. I found this great photo of her teaching a small group of women. I love it. I can only hope the people who come to class at The Little French Bakery, or my classes at Bekah Kates and other sites feel the same pleasure and joy. Today I have a recipe I think you'll love. We just had something very similar on a trip to Door County. It's fresh, quick, easy, and very French. Find radishes with stems. They can be fancy or just a bunch from the grocery store. Find some great butter. I prefer unsalted so you can add the sea salt later. If you don't have access to European butter, a stick of butter will be just fine. In the deli area of the grocery, pick up a small package of chevre (goat cheese). The package may say crotin on the top. One will be fine. Lastly, you'll want some nice coarse salt. Fleur de Sel would be great, but don't stress over it. Just try to find some salt other than table salt. But... if it's all you have, it's ok.
Well, we're all assembled and ready to go. The butter and goat cheese should be soft, at room temperature. Using a Kitchenaid Mixer (fitted with the paddle), a big wooden spoon, or a hand mixer. Whip the two together until they're light a fluffy. Be careful not to overmix. If it gets too warm, the butter will melt and it be too soupy. Clean the radishes, snip off the tops and roots. Find a pretty plate, and spread a layer of the cheese mixture on the plate. Stand the radishes up on the cheese/butter mix and sprinkle with fleur de sel (salt). I found the flakes of salt in a market in New York City last summer. This is the first time I've used it, but it worked perfectly. Crunchy and light. If you don't like goat cheese by itself, I think you'll like this. The butter really mellows the flavor and adds a nice creaminess. 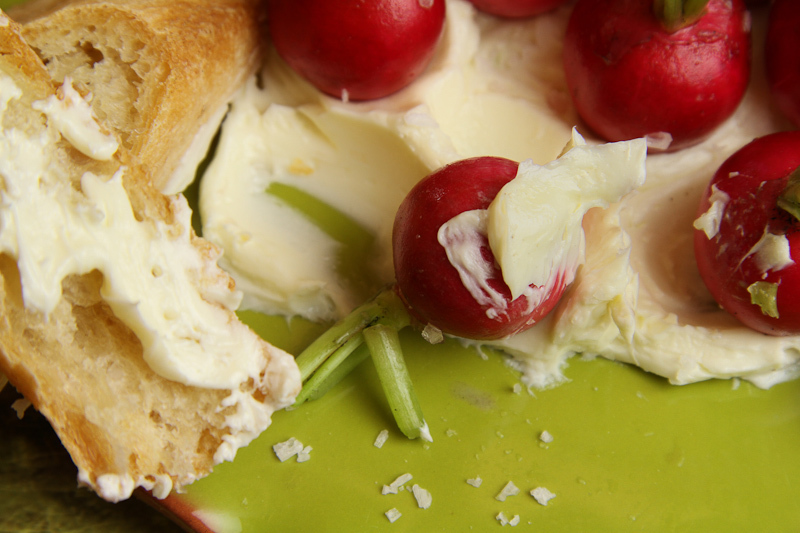 The butter is also great on baguettes while you're nibbling of the radishes. Mix cheese and butter in mixer or with spoon, until smooth. Spread on small plate and top with radishes (stems & roots removed). Garnish with sea salt and enjoy!